Many poems have been written in response to Ava Lee's paintings. Following, are various poets' contributions. 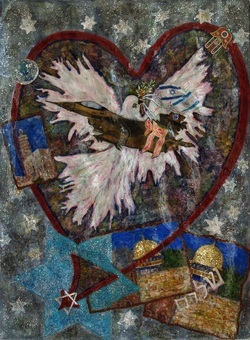 This mixed-media painting was recently on exhibit in the Art Gallery of the Jewish Community Centre Of Greater Vancouver. The poet, Daniela Elza, chose to write about her deeply moving interpretation of this piece. this is the homeland you wonder through. How will you draw the map of your days under domed temples? How will you shake the fever the television snow will not cool down? amidst the planes of war that do not stop dropping through the silences the dead keep sacred. How will you? when the bitter water closes around your ankles like shackles. How will you step in further? This morning I woke up with the crows is what I was trying to tell you last night. My heart - a monk facing the monastery wall of my life. And what if you stopped thinking this is you? stop thinking you are separate from these crows. How will you speak the despair you wake up with the desire that unbuttons into your day? is what I was trying to ask you tomorrow. Matters of the heart are never simple you say. You say your heart is a dark hole. a wounded bird an Icarus flying too close to the sun. Yet the sun still fanfares through the stone city splashes it in its brightest colours sprouts through the green vertebrae of spring. skipping over bitter water. How will you catch yourself in your two hands when life hurls you over the edge? How will you reclaim your body as an instrument for singing the world again? We finger our artistic spectrums search for the right metaphors to say: Eros is freedom. to say spirit is not another matter and for that matter is full of spirit. To know yourself as you are when you are loved. perfect that is. then learn that nothing is perfect. Stilll your want is to go back go back go back and rewrite your unforgiving life. Your words will never be good enough. Let the punctuation be sunshine streaming down your shoulder in a walled-in city meaning to say nothing. Just here. stop. pause. question. exclaim. And here show your papers, your passport. Your ellipses walk away ... from a crowded history. Today all we can do is imagine going through the museum of apologies. (nauseated but still interested.) to see how we get it wrong again and again. Learn how to say sorry. how to manage our households knotted by fear plagued by doubt. How to remember You are my other Me. I am working on becoming an expert on not being an expert. a birded wound so to speak. because I need to figure things out. sThis mixed-media painting was recently on exhibit in the Art Gallery of the Jewish Community Centre Of Greater Vancouver. The poet, Bernice Lever, chose to write about her deeply moving interpretation of this piece. Thank you, Ava Lee Millman Fisher, for your amazing and diverse roomful of your artworks. Your "I SEE MUSIC" was on March 1 and still is a deeply emotional, but also uplifting display. I am honoured to give my poetic responses on our shared world with our eagle brothers and sisters. Temple music flows free between armed soldiers and faithful pilgrims joining all for an hour. Flowers with metal petals display the power of their lasting attraction. Ava Lee's art flies like dancing steps causing viewer's hearts to beat to her tunes. This mixed-media painting is currently on exhibit in the Art Gallery of the Jewish Community Centre Of Greater Vancouver. The poet, Deborah L. Kelly, chose to write about her deeply moving experience of the artwork. I stood and looked; I felt. world in which I lived. sustenance for the thirsty soul. colour and dance of music. This mixed-media painting is currently on exhibit in the Art Gallery of the Jewish Community Centre Of Greater Vancouver. The poet, Lozan Yamolky, chose to write about her deeply moving experience of the artwork. This mixed-media painting is currently on exhibit in the Art Gallery of the Jewish Community Centre Of Greater Vancouver. The poet, David Geary, chose to write about his deeply moving experience of the artwork. And then they all started up again – playing hell – hell for leather. You know, Miles, tonight, tonight, my friend, you kind of messed up your solo on my song - Round Midnight. And Miles, said – Uh huh. Uh huh, is that right? I messed up your Round Midnight? GET OUT! Get the f*ck out of my car! And there was a pause, and a BEAT. No one knew where to look. Up or down or all around. AND Miles never looked back… except when he faced the back of the stage, because the people – THE WHITE PEOPLE - had paid $500 bucks to see the black man blow is horn, but so what… right, so what. Miles said: Space music'd be really something... but they don't have no gravity up there. You couldn't have no downbeat! And when people called Miles a legend, he said: A legend is an old man with a cane known for what he used to do. I'm still doing it. Miles Davis’s father said: Son, don’t have nothing to fall back on, otherwise, guess what, you’ll fall back. Um… funny cigarettes, um funny in what way? Like cigarettes that would make you laugh? Yeah, said Monk, could do. Could do. there's a girl here and she's almost you, almost blue. that everyone keeps saying look… cool. And the teacher declared he would get for his punishment – the wooden ruler across his hand…. SIX OF THE BEST! The 70s. New Zealand. Pre-Hobbits contact and Colonisation. And so far back the teacher got out the brand new metric ruler. The fancy one that had just replaced the good old yard ruler. … but then a clunk. What the hell… was that? You know one of those presents you buy for everyone but is really for you. Hmm… David, do we have to listen to funeral music while we eat? She has a dark side. When I buy __c__ool vintage clothes from Op-Shops and the Salvation Army, she always says: Oh…… and who died in that? I did. I just died in it right now. Cos I can’t change you. Can’t take off your black hat. And now I’m back there, at the dinner table, standing up slowly, walking slowly over to the stereo -- considering scratching the needle right across Miles Davis’s face to make a point, but that… that would be… petty. So I take Miles off the turntable, blow dust gently off his face… phwoo… and put him gently back in his sleeve.